I’ve lived here almost 10 years and over all those days, weeks and months I’ve never warmed to the popcorn ceilings. It’s fair to say I find them hideous. In those rare, fleeting moments of home improvement fury I’ve considered getting them replaced, but it’s an expensive and messy process. Plus I’d have to schedule time for people to come to the house and give estimates. Really, who has the energy? I rationalize since I generally look straight ahead or down towards the ground while walking (to ensure my feet are moving forward), the bitter reality of my popcorn ceilings is easily dismissed from my consciousness. I’m blessed (or cursed) with a relatively fertile imagination. I’ve looked at cloud formations and seen a running dog or Elvis’ face, Vegas years. I’ve taken Rorschach tests and am still allowed walk the streets alone. But when I look at popcorn ceilings I can’t fathom, from a design perspective, why they were so named. 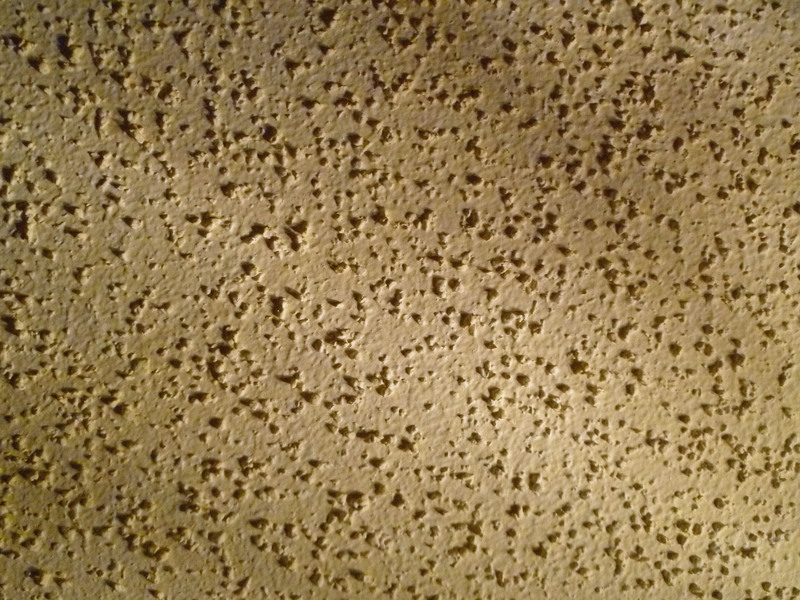 I see a ceiling with bumps, bumps which look absolutely nothing like popcorn in any stage of development. They don’t resemble unpopped kernels. They can’t be mistaken for those unfortunate kernels which never seem to fully sprout. (Poor things always have a wisp of white struggling to escape the hull, but seem as if they simply could not muster the energy to complete their metamorphosis.) The bumps are too small and compact to pass as fully popped kernels, the big, fluffy ones drenched in butter. (Alright, drenched in butter is somewhat of a cheat since that’s not popcorn’s natural state. 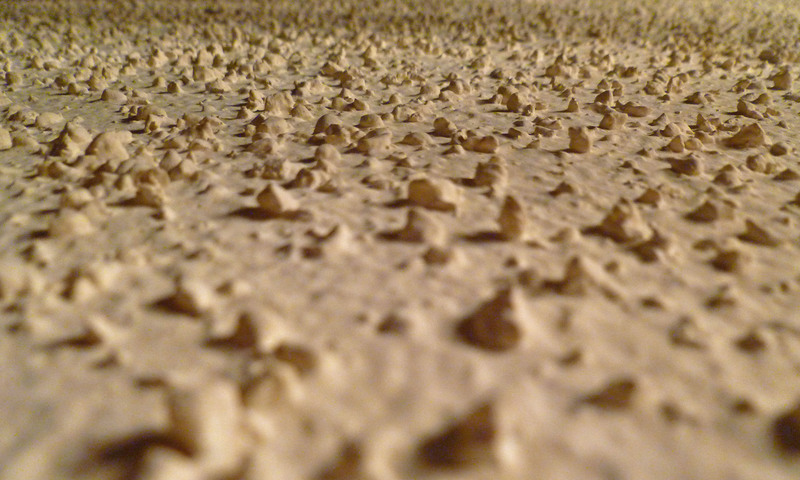 I counter that a ceiling’s natural state doesn’t look like the lunar surface.) Even those kernels which matured early only to end up charred like, well like a burnt piece of popcorn, bear no resemblance to these blasted ceilings. Look closely and you can see Armstrong's bootprints. I’m forced to conclude this particular interior design flourish was so named not because of an aesthetic resemblance to popcorn. Rather some wise contractor took a look at the first popcorn ceiling and realized damage control was immediately needed. The solution: a cute and homey name. Thus, popcorn ceilings. Whether that name is cute and homey is debatable. What’s not debatable is it sounds a hell of a lot better than Dermatologist’s Nightmare Ceilings, Lazy Way Out Ceilings or Construction Cost Cutting Trick #14 Ceilings. Happily, this fad in design/construction/obscuration of fraud passed. Useless. I guess if you’re an ant who walks along the ceiling it adds excitement. Otherwise, I agree.